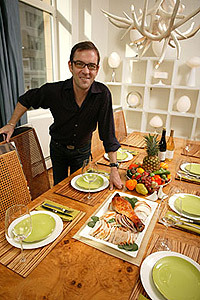 If you're anything like Ted Allen—or most Americans—Thanksgiving ranks high among your favorite holidays. According to the Fab Foodie of Queer Eye for the Straight Guy fame, there are so many reasons to love Turkey Day: "Everybody has the day off. Everybody loves to eat the great traditional dishes. People are beginning to think about the holiday season and getting in the mood for the soothing sounds of football on the telly. It's getting nippy outside in much of the country, signaling that it's time to bake, roast, and braise in a big way." Not to mention, Allen says, entertaining for such a celebration is "a multimedia platform for personal expression" through your food, decor, lighting, and music choices. "Not to sound too much like Christopher Guest in Waiting for Guffman," he says, "but on Thanksgiving you're putting on a show!" What's not to love about Thanksgiving? Try the hassle, mess, and stress that all too often accompany planning and cooking the most fabulous feast of the year. Enter Allen, who has devised a better way to go about it: a simple but elegant Thanksgiving meal for eight, comprised of delicious make-ahead dishes from his cookbook The Food You Want to Eat, with an even easier deconstructed turkey developed exclusively for Epicurious, accompanied by sophisticated drink selections in a relaxed setting. Allen also shared some of his no-stress entertaining tips and invited us into his home to show us how it's done. The table's already elegantly set. You're relaxed and mingling with your guests, conversing over Champagne in eager anticipation of the appointed mealtime. When it comes, you carry perfectly warmed food in pretty serving dishes to the table, where your guests are able to dig in at once. Or at least that's the fantasy. More often, Thanksgiving dinner arrives late on the table. It's waylaid by chaotic fumbling among piles of dirty prep plates as well as timing issues and lack of oven space—all in an attempt to deliver both warm side dishes and turkey at the same time. The best way to minimize potential pre-meal meltdown is to cook as much ahead of time as you can, Allen says, and to clean as you go. Most of the dishes he has chosen for Epicurious are perfect for making ahead: the Parmesan crisps can be made up to 3 days before (store in an airtight container) and the rosemary olives can marinate in the refrigerator up to a couple days prior. The sage stuffing (Allen's favorite comes from our site) can be assembled, though not baked, and refrigerated for up to two days ahead. On the day of the feast, simply bring it to room temperature while roasting the turkey and bake it once the bird is done. In addition, both the string beans and root vegetables can be roasted ahead and also warmed in the oven while the turkey sits, but they're perfectly delicious served at room temperature. You can even bake the brownies a day ahead—a simple 30-second shot in the microwave is all they need to regain their just-baked warmth. But it's the meal's centerpiece that's the real time- and stress-saver: a deconstructed turkey. "No cooking task creates more agita across our great nation than roasting the holiday turkey," Allen says. "First, it takes days to thaw safely in the fridge and consumes precious space when you need it most. Once thawed and oven-bound, the breast meat on a whole turkey cooks faster than the dark meat. It's also easy to burn the skin before the meat is cooked through. The darned thing is just plain too big." The solution is to purchase, thaw, brine, and then roast the turkey in parts. The advantages, Allen says, are many: First, frozen turkey pieces thaw—and cook—much faster than a whole bird; there's no trussing and no stuffing; and using pieces means your carving job is halfway done before you even start. All of which means your turkey can be served more quickly, and, hence, warmer. "Yes, you lose the beautiful, glossy trophy bird in the center of the table," Allen says, "but, then, you can arrange a pretty platter of sliced bird that's quite magnificent, too. And you can buy extra legs, if you like, affording you the chance to tell children that you're serving a rare, four-legged turkey. I can't wait to try this on my nephews." That leaves only the butternut squash pie and the cauliflower purée. Like the stuffing, the squash pie can be assembled ahead and refrigerated. And since it requires the same cooking temperature as the turkey, you can cook both at the same time if your oven space allows. The cauliflower purée is a snap to steam and then needs only a gentle reheat on the stovetop. Warm this while slicing the turkey breast or making the gravy, then you're good to go. Indeed, the stress of Thanksgiving has been known to drive some to drink. 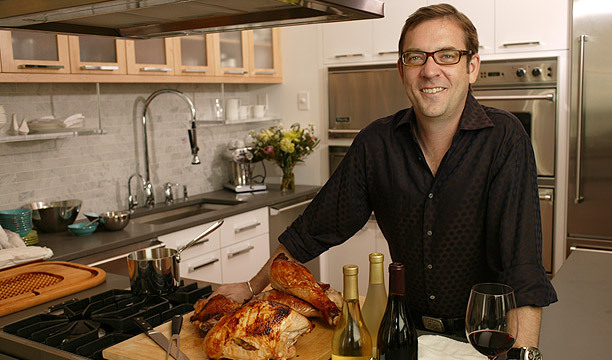 But since Ted Allen's plan eliminates stress for you, he focuses on drink choices that are as streamlined and sophisticatedly simple as the meal itself: Start (and finish) your celebration with Champagne and rely on quality wines to augment your dinner. "For a family affair such as Thanksgiving," Allen says, "cocktails don't feel right. I prefer Champagne." Not only is a nice bubbly a light way to whet the appetite, it's also the perfect pairing for the Parmesan crisps and rosemary olive hors d'oeuvres. For a nicely priced choice, Allen suggests Mumm Cuvée Napa. For the white wine–lovers, Allen particularly likes Mondavi's crisp Fumé Blanc with roast turkey. Alternatively, he suggests Alsatian Pinot Gris from Trimbach or Pierre Sparr. Another good thing about Thanksgiving being a family holiday: You shouldn't have to worry too much about people judging you for your china and candlesticks—it's not like cooking dinner for your boss or Martha Stewart," says Allen. The relaxed, familial vibe of the holiday, then, should be your cue for your decor and music choices. Allen's favorite way to get maximum design impact with minimal effort on Thanksgiving is to use the food itself to make the room beautiful. "Bowls full of veggies, fruits, nuts, olives, cascading piles of cheese and bread, and platters full of beautiful cookies are all wonderful," Allen says. "And later, you can eat them." Flowers are always nice, too, he says, though make sure they're nonfragrant (no lilies, please) and that the arrangement is short enough that it won't block any of your guests' happy faces from view. For the meal itself, arrange the turkey artfully on a platter—perhaps garnishing with some fresh herbs or kumquats for color—and transfer your side dishes to nice serving-ware to place on the table. This presents a neater, more unified look than a haphazard mix of cookware scattered about, and depending on the serving-ware you have, it's simple way to lend color or style to the table. Finally, Allen instructs, "Dim the lights a little, light a bunch of votives, and put a fire in the fireplace—you're mostly there." To further augment the mood, make a mellow but chic playlist, Allen says. "Use your iTunes, make a playlist, and make sure the music never stops." For a cool, urbane, sophisticated feeling during cocktails and dinner, he says, there is no beating Chet Baker. Allen also likes Acid House Kings, Beth Orton, Calexico and Iron & Wine (In the Reins), Duncan Sheik, Eels, Ivy (Apartment Life), Josh Rouse, Nada Surf, The Pernice Brothers, Rogue Wave, Sparklehorse, Sufjan Stevens, Super Furry Animals, and Yo La Tengo. "If I were at your dinner party and you played these things, I would be delighted. For a subversive, slightly shaggier-haired crowd, I might play the quietly weird music by Kurt Wagner's quirky Nashville collective, Lambchop—gorgeous music, everything from gentle alt-country to Curtis Mayfield covers." Allen also suggests the soft, beautiful work of Hem ("Rabbit Songs"), Belle and Sebastian, or Kings of Convenience. "And if this list is too ridiculous and intimidating," he says, "just go back to the top: Chet Baker." • As mentioned in The Food section, make as much of your meal ahead of time as possible, even completing cooking tasks over a couple days. "I make-ahead all of these dishes," Allen says: "Deviled eggs, cranberry sauce, coleslaws, room-temperature veggies, salads, cakes, pies, and most desserts." This will allow you a more relaxed and leisurely pace come Turkey Day. • Plan to serve several dishes that don't need to be hot to minimize competition for the oven. • Think about reducing the sheer number of side dishes you plan to serve, suggests Allen. "While it's opulent and celebratory to have 27 different tastes to choose from, the reality is that you're creating a massive amount of work so that each person can sample one bite of each thing." • Make a list for yourself if you have to, and create a timeline. This doesn't have to be an elaborate plan, but listing out all the tasks and chores you have, then arranging them in a way that's most efficient, helps keep you organized and, more importantly, calm. • Act early. Don't wait until the last minute to take stock of what you need — whether it be a replacement serving platter or to put an order in for your organic, kosher turkey. That way, you can laugh from afar at the harried hordes clawing for the last can of pumpkin rather than being one of them. • You've cooked as much of your food early as possible (good job! ), so do the same thing with your table. Set it the night before as your brownies are baking, then that's one less thing you have to think about come morning. • Another way to avoid overwhelming yourself with work, Allen says, is to ask your guests to bring a side dish from home (check out our Potluck Planner for more tips). Or enlist your guests' help in your own kitchen, either assigning them various tasks when they arrive or asking some to come early to help with the cooking. According to Allen, "It's always wonderful to cook with friends; that's one of my favorite things." • On the other hand, sometimes the stress and complexity of Thanksgiving can be worsened by a kitchen full of folks, especially if you're territorial about your kitchen. In that case, ask your guests to help in other ways, by setting the table or pouring Champagne and passing hors d'oeuvres. Either way, you're lessening your workload, which is a good thing. • Plan to serve minimal prefeast hors d'oeuvres, focusing your efforts instead on the meal. "In my parents' house," says Allen, "Mom restricts predinner snacking to things like carrot sticks — damned if she's gonna let people fill up on Cheez-Its when she's going to all that trouble." • Keeping all your food warm for serving is a perennial problem for which, luckily, there are several solutions. First, choose dishes that taste great at room temperature, like the string beans and roasted vegetables, Allen says. Perhaps you're lucky enough to have a warming drawer or one of those sideboard food-warming platters from the '60s. If not, Allen says, choose your serving pieces strategically to help you keep things hot. "Heavy cast-iron skillets and cookware such as Staub and Le Creuset hold heat forever," he says. • Finally, make sure you have comfy spaces for your guests to sprawl after the feast. "The only postdinner activity I'm interested in involves a very comfortable sofa, with one of Dad's fascinating golf or football games droning pleasantly in the background as the tryptophan kicks in."